Four books perfect for a crystal, frosted winter's night. 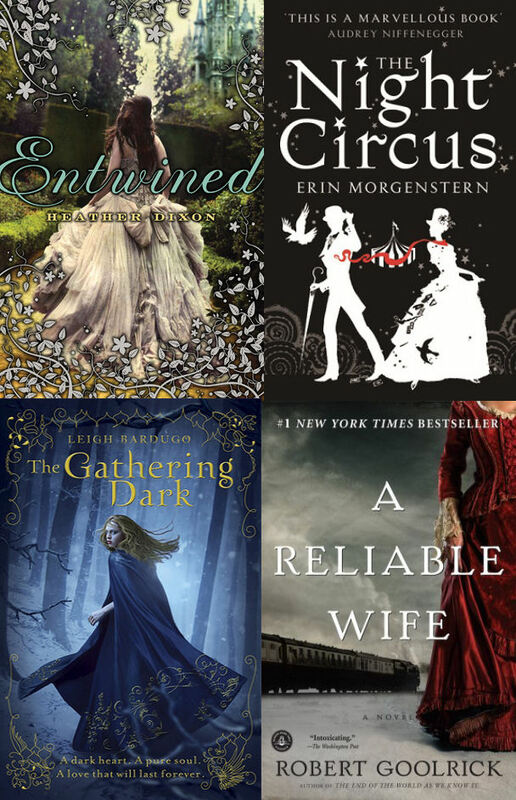 Entwined by Heather Dixon : a retelling of the twelve dancing princesses fairytale with a passionate quest for love, a challenging look into family dynamics, an intricate battle against darkness and a delicate sprinkling of magic. The Night Circus by Erin Morgenstern: a magical tale about the fight between good and evil, light and darkness, life and death. A masterpiece dancing with snowflakes and sunshine. The Gathering Dark (or Shadow and Bone) by Leigh Bardugo: the beginning notes of an epic steampunk fantasy based on a russian myth, luminated by the discovery of an inner strength and the battle of a lifetime. A Reliable Wife by Robert Goolrick: an adult historical thriller with a hidden, bittersweet message about the meaning of life. Everyone has an agenda in this book, but the results of their interactions in a frozen coutnry end up being beyond anyone's imagination. Money may be the root of all evil, but it turns out all evil can hold a tiny bit of goodness in the end.